Trap-Neuter-Return (TNR) is the trapping feral cats, spay or neutering them, and returning them to live outside, ideally in the same location from which they came. Note: A drop trap is different than the standard box-style trap. 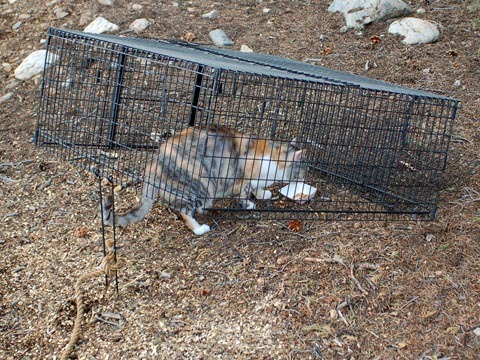 A drop trap is used when a feral cat refuses to go in a box-style trap, or one is trying to catch a particular feral cat, such as the last cat in the colony that still needs spay-neuter. Planned Pethood Taos has a drop trap. Please see Drop Trap photos on this page. 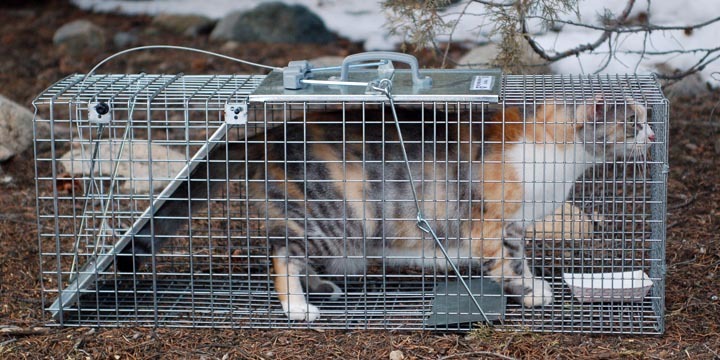 Need to Borrow a Feral Cat Trap? Contact: Planned Pethood Taos 575-613-4110, or Northern New Mexico Friends of Animals 575-586-0784 (located in Questa), or Taos Town 575-758-2216 or County 575-737-6488 Animal Control, Taos Feral Feline Friends (Note: TFFF only loans traps for clients they are giving a local spay-neuter appointment). Want to Buy a Feral Cat Trap? Havahart Feral Cat Traps and Tomahawk Cat Traps can be bought on Amazon.com as well as directly from the manufacturer. The Española Valley Humane 505-753-0228 and Taos Feral Feline Friends (TFFF) 575-737-9208 offer FREE spay-neuter & vaccination for feral cats in Taos Town/County/Pueblo. NOTE: TFFF is currently helping with cat TNR in only a limited number of cases. For more information on feral cats, such as how to care for a feral cat colony, how to protect feral cats in the winter, how to age & socialize feral kittens so that they can be adopted as pets, etc., please go to our Feral Cat page within Animal Care. Feral cat who is spayed as indicated by tipped right ear. Photo copyrighted. Cat trapped in feral cat trap. For photo purposes: Trap not lined with newspaper to show trigger plate. 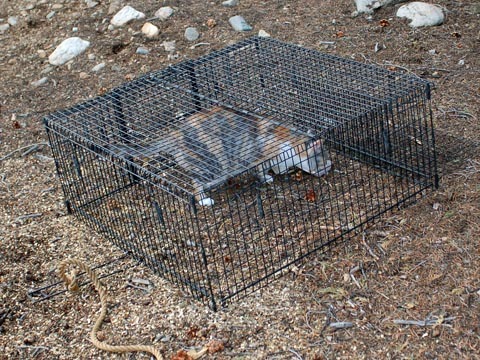 Cat inside of feral cat DROP style trap. String is tied to temporary support bar. The string is pulled when cat is fully within trap. Cat trapped inside of DROP style feral cat trap. Transfer cage will then be attached to side.